Replacing the 351C-2V back in the 1970 Mustang convertible, I cannot remember what line connects to one of the ports of the vacuum manifold attached to the fire wall. 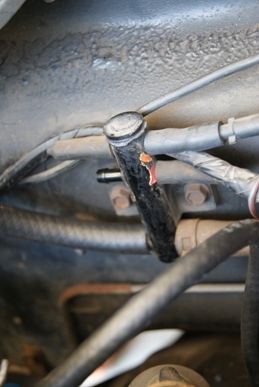 There are 6 ports total and the bottom 2 are the largest with one connecting to the vacuum fitting on the rear of the intake manifold (which also has a smaller fitting connecting to the transmission line) and the other connects to the power bakes booster. In the middle are 1/4" ports: the left side (drivers) is capped off and the right side is open. It is shiny clean so I know there was a line (or cap)there when I pulled the engine. The top 2 ports are also 1/4" and the right one is capped off and the left on connects to an aftermarket cruise control. The car does not have air conditioning nor other vacuum controlled accessories like power door locks. Any ideas what should be attached to that vacuum port? I have included some photos. Based on what you said about your engine, brakes and options, I would expect that the port on the firewall vacuum tee, would have only had a plug. Some of the vacuum lines that could possibly be attached to the vacuum distributor are the A/C vacuum line, cruise control and in a 1969 Mustang, a port for the tilt wheel option. All of the other basic vacuum port needs for 1970 Mustang Vacuum lines are off the intake manifold or come from ported vacuum on the carburetor body. This seems to be a kind of one size fits all accessory fitting, so both, factory and dealer installed options could be easily plumbed in. Switch from manual to automatic transmission, here's your vacuum. Need power brakes? Sure, here's a big port for you. How about factory air conditioning? No. Problem, here's the vacuum for your canister, air doors etc. By the way, if you are looking at adding a shaker hood for your Mustang, and of course the air cleaner assembly and flapper door, the shaker option didn't use the ports.